Marie Lund, Trenton Doyle Hancock, Janice Kerbel, Marjetica Potrc, Katya Sander, Ultra-red. 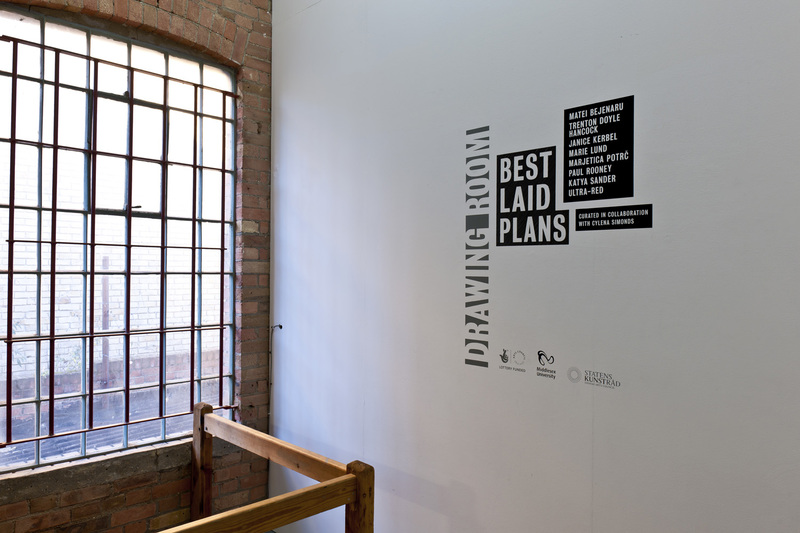 Best Laid Plans is conceived by Cylena Simonds in collaboration with Drawing Room. The artists in this exhibition use different forms of drawing to create models for alternative ways of living in or viewing the modern world. Strategic planning is associated with ‘objective’ graphic forms such as maps, diagrams, graphs, charts and sketches. Turning such a notion on its head, the works in this exhibition explore fantastical scenarios, impossible geographies, new beings and habitats and subtle subversions of life as we know it. 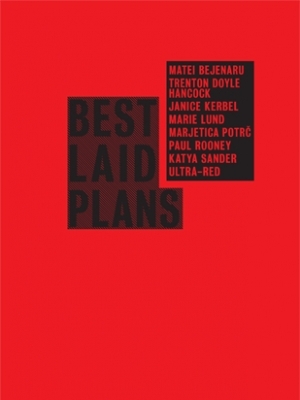 The international artists in Best Laid Plans exploit the positive potential of human fallibility and explore it as a force for imagining new forms of organisation and existence. The simplicity and directness of drawing means that it comes readily to the service of the telling of myths and fables, perfect allegorical means to convey ideas and messages. Trenton Doyle Hancock is best known for his narration of a war between two factions – the mounds and the vegans - who stand as metaphors for extreme views and behaviour. This story has been played out in colourful, figurative drawings, prints, paintings, sculptural and text works. For Best Laid Plans Hancock will create a brand new work, a wall-drawing based on his favourite film, ‘An American Werewolf in London’. In prints, books and radio plays Janice Kerbel gives articulate form to ideas that might best be played out in the imagination or undercover. Kerbel selects an existing location, situation or institution and through a meticulous process of research devises a scenario in which certain situations evolve, free of practical and ideological constraints. ‘Dead Star’ (2006), which will be included in Best Laid Plans, is a large scale copperplate photogravure etching of a town designed for ghosts. Its topography is based on dead stars which map out a terrain designed specifically to meet the needs and proclivities of ghosts. Marie Lund has conceived three new works for Best Laid Plans, which include a sculpture, a work on paper and a performance. Each piece involves an original conceived around the ideals of past moments in history and a reconstruction that takes account of the subsequent passage of time and the works contemporary status. The sculptural work is a bronze relief that recreates the maquette for an idealistic playground; the work on paper investigates the ethics of restoration; and the performance, which will take place during the symposium at Tate Modern, reactivates a visionary architectural plan which has hitherto existed only as a drawing. Marjetica Potrc is a Slovenian artist-architect whose ideas are realised as built architectural projects conceived for specific geographical situations, sculptural works, drawings and prints. Her training as an architect, together with an interest in the educative and communicative potential of art, results in a practice that provides solutions, some schematized and others realised, to real life problems such as the devastation caused by Hurricane Katrina in New Orleans or water shortages in Caracas. Potrc’s fluidly executed and colourful drawings explore a variety of responses, both utopian and realistic, to real-life situations that she encounters. They perform a pedagogic role, informing art audiences of projects that take place beyond the exhibition space. Katya Sander’s works revolve around themes such as the private and public domains and explores language, identity, urban planning and democracy. Her new work for Best Laid Plans is inspired by Modernist architecture encountered during her recent trip to Brazil and imagery from medical journals that visually structures our conception of our physical selves. This imagery is collaged together to form a wall drawing which is animated by video projection. The new work continues her exploration into different forms of visual stimulation and audience response and communication. Working from the notion of the score as both a curriculum and a plan for political action, Ultra-red will present work on paper and in sound from their ongoing project, The Cardew Object, a project commissioned by Drawing Room that took place at the ICA in November 2009. The project involves the collaboration of the School of Echoes (London) and the New School, New York. Drawing from both the voices of participants and key texts of emancipatory thought, such as those by Paulo Freire and Amilcar Cabral, the score becomes not only the record of what has transpired but the basis for future enunciations. Matei Bejenaru’s practice centres around the accelerating changes in the understanding of self-identity, labour and value in post-communist cultures. These conflicting definitions, values and sentiments are often examined from the context of Romania as a failed utopia. For Best Laid Plans Bejenaru has conceived several experimental choral pieces titled ‘Songs for a Better Future’, developed in collaboration with the London-based composer Will Dutta. The project combines musical themes from proletarian choirs, the idealisation of the worker in communism, with themes from electronic music songs of the 1970s which were inspired by the fetishism and idealism of technological progress in the Western world. Paul Rooney’s work, which takes the form of film, video, music and fiction, uses different narrative forms to explore the complexities of representing both historical and contemporary events and situations. He focuses on individuals operating on the margins of society whose activities propose deviant solutions or alternatives to the status quo. Rooney's work for Best Laid Plans is a short story titled 'I Can Travel Far From Here'. Inspired by a website, it consists of a thirteen point plan that involves using toy tanks to save the world for Jesus. Matei Bejenaru was born in 1963 in Suceava, Romania and lives and works in Iasi, Romania. In 1997 Bejenaru established the Periferic Biennial in Iasi which has since developed into an international art biennial. It is now supported by the Vector Association, a non-profit cultural NGO designed to support local contemporary art of which Bejenaru was also a founding member. Selected solo exhibitions include, 2009: Galerie ERSEP Tourcoing (with Yves Robuschi) (FR); Cupola Gallery Iasi (RO); 2007: Galeria Posibila, Bucharest (RO); 2005: Travelling Guide, insert in IDEA Art Magazine, Cluj (RO); R O O M Gallery, Bristol (UK); Vector Gallery Iasi (RO); Galeria Noua, Bucharest (RO). Selected group exhibitions include, 2009: Dacia, Lille 3000, Galerie Comune Tourcoing (FR); Performing the East, Salzburger Kunstverein (A); 2008: Move On, Futura Art Center Prague (CZ); Spa Port, Banja Luka (BA); Taipei Biennial (TW); Schengen, Finekost Gallery Berlin (DE); 2007: Blurrr 6 Performance Festival, Tel Aviv (IL); Social Cooking Romania, NGBK Berlin (DE); The Irresistible Force, Tate Modern (UK). Trenton Doyle Hancock was born in 1974 in Oklahoma City, USA and lives and works in Houston, Texas. Forthcoming exhibitions include Big New Field: Artists in the Cowboys Stadium Art Program, Dallas Museum of Art, Texas. 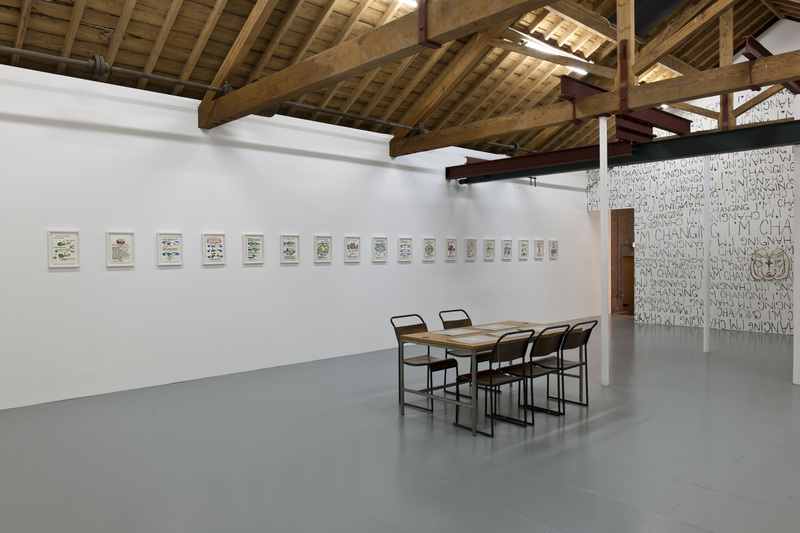 Selected solo exhibitions include, 2010: Singapore Tyler Print Institute (SG); Olympic Sculpture Park, Seattle Art Museum (USA); Dunn and Brown Contemporary, Dallas (USA); 2008: James Cohan Gallery, New York (USA); Galleria Marabini, Bologna (IT); Institute for Contemporary Art at the University of Pennsylvania, Philadelphia (USA); 2007: The Fruitmarket, Edinburgh (UK); Boijmans Van Beuningen, Rotterdam (NE); 2006: James Cohan Gallery, New York (USA); 2005: Project Gallery, ARCO International Art Fair, Madrid (ES). Selected group exhibitions include, 2010: Mutant Pop and the Living Image, Loyal Gallery, Malmos (SE); Get Out!, Olympic Sculpture Park, Seattle (USA); Cut, Shuffle and Draw, Columbus State University (USA); From Then to Now: Masterworks of Contemporary African American Art, Museum of Contemporary Art, Cleveland (USA); Nature, Once Removed, Lehman College Art Gallery, New York (USA); 2009: Young Americans, James Cohan Gallery, Shanghai (CN); Texas Draws, The Southwest School of Art and Craft, San Antonio (USA); Lover, OnStellarRays, New York (USA); Rich Text, Fleisher Ollman Gallery, Philadelphia (USA); 2008: Prospect 1. New Orleans Biennial, New Orleans (USA); Wunderkammer: A Century of Curiosities, Museum of Modern Art, New York (USA); Darger-ism: Contemporary Artists and Henry Darger, American Folk Art Museum, New York (USA); 2007: Size Matters, Hudson Valley Center for Contemporary Art, Peekskill (USA). Will Dutta is noted for his critical reconsideration of modern-classical music performance-practice through his multiple roles as pianist, collaborator and Creative Producer of Chimera Productions. Connecting the dots between modern dance music and contemporary and experimental art music, recent highlights include performances at Kings Place and Ether 10 at the Southbank Centre, collaborations with the likes of Warp veterans Plaid and sonic artist Scanner and co-productions with BFI Southbank and Tate Britain. Will curates the Blank Canvas series and is also Executive Producer of the award-winning album, Gabriel Prokofiev’s Concerto for Turntables & Orchestra as performed by Heritage Orchestra featuring DJ Yoda (Nonclassical Recordings 2009). His first artist-album is out in 2011. Janice Kerbel was born in 1969 in Canada and lives and works in London. She has a forthcoming solo exhibition at Chisenhale Gallery, London (2011). Selected solo exhibitions include, 2010: Art Now, Tate Britain; 2009: greengrassi, London (UK); Kitchener Waterloo Art Gallery (CA); 2008: Optica, Montreal (CA); European Kunsthalle, Cologne (DE); 2007: Nick Silver Can’t Sleep: A Radio Play for Insomniacs, live performance, Art Now Live, Tate Britain (UK); Vamiali’s, Athens (GR); Remarkable included in Frieze Art Fair Projects; 2006:Moderna Musset, Stockholm (SE);Locus +, Newcastle (UK); Nick Silver Can’t Sleep broadcast on BBC Radio 3. 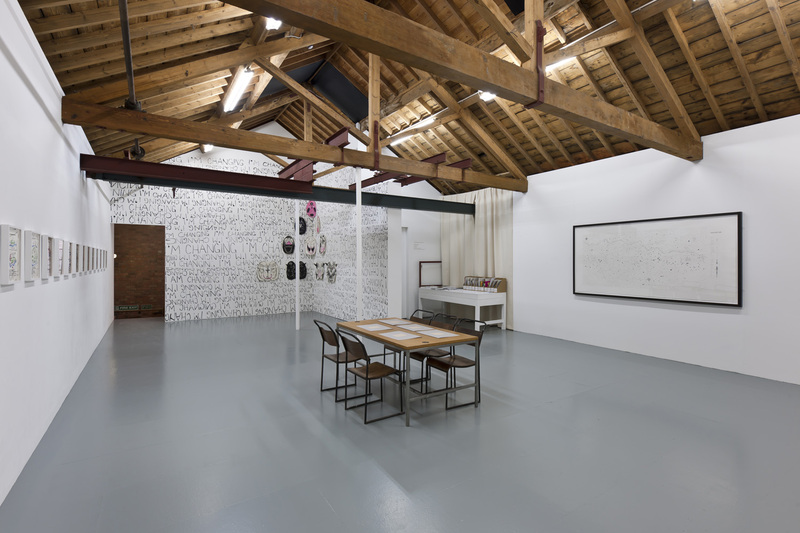 Selected group exhibitions include, 2010: Recipes for an Encounter, Dorsky Gallery, New York (USA); 2009: Poor. Old. Tired. Horse., ICA, London (UK); Gartenstadt, Kunstverein Hildesheim (DE); Magic, Hayward Touring Show; 2008: Janice Kerbel, Silke Otto Knapp, Alan Ruppersberg, Galerie Karin Guenther, Hamburg (DE); Pleinairism, i8 Gallery, Reykjavik (IS); Acclimation, Villa Arson, Nice (FR); See History, Kunsthalle Kiel (DE) & Krobath Wimmer Gallery, Vienna (AT). Her book, 15 Lombard St, (2000) is published by Bookworks, London. Marie Lund was born in 1976 in Copenhagen, Denmark, and lives and works in London. Lund is currently exhibiting ‘The Object Lessons’ at Mudam, Luxembourg, as well in the group exhibition ‘Could We Also Be Temporarily’ at the 21rozendaal Centre for Contemporary Art. She is also participating in ‘Tumult’, Public art festival, Lolland Falster, Denmark and in the Frieze Sculpture Park. Forthcoming exhibitions include group show at Galleri Opdahl, Norway, a three person show with Jiri Kovanda and Nina Beier at DOX, Prague and a solo show at Laura Bartlett Gallery, London. Lund also works collaboratively with Nina Beier. Their most recent solo exhibitions include ‘The Object Lessons’, De Vleeshal, Middelburg (2009); The Testimony, Les Sabots..., Nomas Foundation, Rome (2009); Permanent Collection, Croy Nielsen, Berlin (2009); Loss and Cause, Projectos Monclova, Mexico City (2009); Two Women, Laura Bartlett Gallery, London (2008). They have previously exhibited in group shows at both Hayward Gallery, Tate Britain and ICA London. Marjetica Potrc was born in 1953 in Ljubljana, Slovenia, where she continues to live and work. Selected solo exhibitions include, 2010: Galerie Nordenhak, Stockholm (SE); Meulensteen Gallery, New York (USA); Rainwater Harvesting, on-site project, St. Erasmo, Venice (IT); 2009: Stedelijk Museum Goes West, Nieuw West, Amsterdam (NL); Kunsthalle Lingen (DE); 2008: Max Protetch Gallery, New York (USA); 2007: Barbican Art Gallery, London (UK); Blow de La Barra Gallery, London (UK); Galerie Nordenhake, Berlin (DE). Selected group exhibitions, 2010: Common Ground: Projects for the Lagoon, Bevilacqua La Masa Foundation, Venice (IT); 5x5Castelló10. Premi Internacional d'Art Contemporani Diputació de Castelló (ES); 6th Triennial of Contemporary Art in Slovenia, Moderna Galerija, Ljubljana (SI); The Promises of the Past, Centre Pompidou, Paris (FR); EMSCHERKUNST.2010, Essen (DE); 2009: Making Worlds, 53rd International Venice Biennale, Venice (IT); 31 Brazilian Art Panorama, Museu de Arte Moderna de Sao Paulo (BR); Shenzhen & Hong Kong Bi-city Biennale of Urbanism/Architecture, Shenzhen Civic Square, Shenzhen (CN); Insiders - Practices, Customs, Know-How, Musée d´Art Contemporain, Bordeaux (FR); Everything, then, passes between us, Kölnischer Kunstverein, Cologne (DE); OPEN e v + a 2009, Reading the City, Limerick City (IE); Invisible Borders, Lille3000, Lille (FR); Islands + Ghettos, NGBK Berlin (DE). Paul Rooney was born in 1967 in Liverpool, where he still lives and works. He has had residencies at Dundee Contemporary Arts/University of Dundee VRC; Proyecto Batiscafo, Cuba; Tate Liverpool (MOMART Fellowship) and was the ACE Oxford-Melbourne Artist Fellow for 2004. Paul was the winner of the second Northern Art Prize in 2009. Recent solo exhibitions include 2010: Spacex, Exeter, UK; ‘Letters That Rot’ (and ‘Magazine 10’ residency), Edinburgh Sculpture Workshop, Edinburgh Arts Festival; ‘Paul Rooney’, Durham Art Gallery; ‘McKenzie’, St Andrew’s Church, Liverpool; ‘Bellevue’, Harewood House, Leeds; ‘Thin Air’, Leeds Metropolitan University and Expo Leeds (presented by Sound and Music); 2008: ‘Lost High Street’, Collective Gallery, Edinburgh. Recent group exhibitions include 2010: ‘Twenty-One’, Harewood House, Leeds; 2009: ‘InCounter Sound – Video – Text’, Campbell Works, London; 2008: ‘Running Time: Artist Films in Scotland 1960 to Now’, Dean Gallery, National Galleries of Scotland; 2007: ‘Cine y Casi Cine (Cinema and Almost Cinema)’, Museo Reina Sofia, Madrid. Forthcoming exhibitions include the Storey Institute, Lancaster in 2010 and the Grundy Art Gallery, Blackpool and Outpost, Norwich in 2011. Katya Sander was born in 1970 in Denmark and she lives and works in Copenhagen and Berlin. Selected solo exhibitions include, 2010: Project Arts Centre, Dublin (IE); 2009: RedCat / Calarts Downtown Center for Innovative Visual, Performing and Media Arts, Los Angeles (USA); Künstlerhaus Stuttgart (DE); 2007: GENERATOR, Trondheim (NO); Zeppelin University at Flughafen Tempelhof, Berlin (DE); 2005: MuMoK / Museum Moderner Kunst, Vienna (AT). 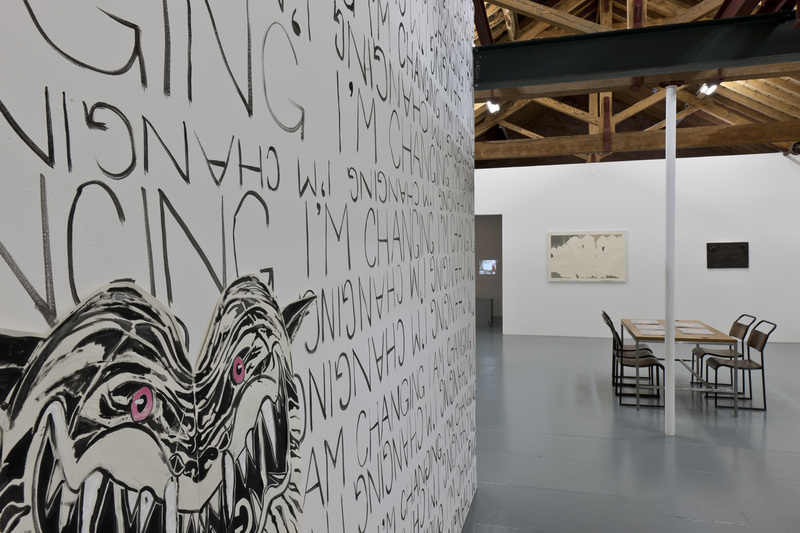 Selected group exhibitions include: 2009: 9 Scripts from a Nation at War, Tate Modern (UK); Whose Cosmopolitism? Research Institute for Cosmopolitan Cultures, University of Manchester (UK); 2008-9: Coming to You LIVE, Art in General (Bloomberg Building), New York (USA); The Greenroom, CCS Bard, Hessel Museum (USA); 2008: October Salon, 49th edition, Belgrade Cultural Centre, Belgrade (RS); REALITY EFFECTS, Henie Onstad Kunstsenter, Hovikodden, Oslo (NO); City as Screen, Roskilde Kunstmuseum (DK); Socle Du Monde, Herning Kunstmuseum (DK); Moirés, Kunstraum Universität Lüneburg (DE); War Stories, MassArt, Massachusetts (USA). Founded in 1994 by two AIDS activists in Los Angeles, Ultra-red conduct sound investigations in collaboration with social justice movements where sound is the medium and the site of inquiry. With nine members located in North America and Europe, the collective produce recordings, performances, workshops, radio broadcasts and installations. Ultra-red's investigations have been hosted by institutions such as Tate Britain and Serpentine Gallery. Selected solo exhibitions include, 2009: Raven Row, London (UK); 2008: KwaZulu-Natal Society of Arts, Durban (ZA); 2007: Plymouth Art Centre, Plymouth (UK); LAXART, Los Angeles (USA); 2006: Art Gallery of Ontario, Toronto (CA). Selected group exhibitions include: 2009: See This Sound, Lentos Museum, Linz (AT); 2008: NobelPrize, UKS Galleri, Oslo (NO); Floteson, KHM Gallery, Malmö (SE); Make Art Stop AIDS, Fowler Museum, LA (USA); 2007: Oasis Sonoro, Cal State University, Long Beach (USA); Ruidos, Silencios y la Transgresion Mordaz, La Casa Encendida, Madrid (ES).